! PLEASE READ THIS ENTIRE DOCUMENT BEFORE EVEN THINKING OF ATTEMPTING THIS CONVERSION ! PLEASE NOTE : Due to some conflicting information regarding te Fan Speed Controller wiring, I have deliberately left this section out, until I can be 100% sure of how this module should be wired up. Hopefully this information will be sorted out shortly, and the correct information will be posted on the website ! This document describes the theory behind adding the Automatic Climate Control System, as fitted to the EA-EL Ford Fairmont, Fairlane, and LTD Series. This includes the physical modules required, instructions on Bolting these modules in to place, wiring Information, and operating Instructions. The automatic climate control conversion is suitable for all EA, EB, ED, EF, EL Model Falcons, but unfortunately, is a difficult conversion to carry out. The Whole Instrument Panel will need to be removed, in order to gain access to the Vehicles Airbox. 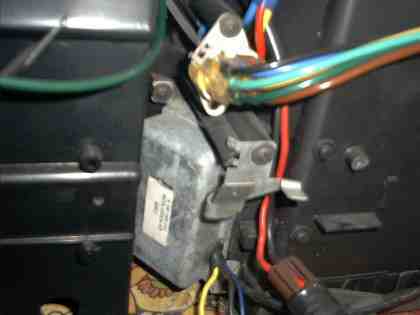 In order to remove the Instrument panel, the steering column will also need to be removed. If that tidbit of information hasnt scared you off yet, then take a big sigh of relief ! The Vehicles Airbox does not need to be removed from the vehicle, nor does it have to be replaced with a Automatic Climate Control Airbox. This means that you will not need to re-gas your Airconditioning, nor will you need to bleed your coolant from the Radiator, and Heater. The Automatic Climate Control system automatically controls heating, cooling and dehumidification to maintain a comfort level selected between 16*C and 32*C when operated in the Auto mode is selected. A mini computer and sensors monitor cabin, outside air, Air Conditioner evaporator, and Engine Temperatures, as well as the strength and effect of direct sunshine, on the interior of the vehicle. The Centre Level and face outlets should be adjusted to direct or further regulate the air flow, to suit your personal comfort. If the display is Blank, then press the "AUTO" Button. The word "AUTO" will appear on the display. Adjust the comfort setting by using the "TEMP" Buttons, to either increase, or decrease the desired temperature setting by 0.5*C.
Depending on the variation between the desired temperature, and the actual cabin temperature, it may take the Climate contol system some time to stabilise. The system is now operating in the Fully Automatic Mode. Your individual comfort setting will be retained by the Climate Control system, and will not need to be re-programmed again when the Ignition is switched Off, or On. The controller will automatically take the information from the various sensors, and will determine the best possible air distribution, Fan speed, as well as Air Conditioner operation, to maintain the desired comfort setting. From time to time, occupants will notice a change in the air distribution mode, and fan speed setting changing. This is the Climate Controls normal mode of operation whereby it is selecting the fastest, and best method to maintain the selected Temperature, and comfort setting. 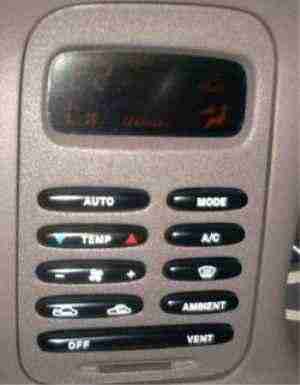 Climate Control overide controls are provided for further selecting personal comfort preferances. Depressing any of these Buttons may place the Climate Control unit into a "MANUAL" mode of operation. To resume the Fully sik Bro Automatic Mode, simply depress the "AUTO" Button. This will cancel any previously selected overiding settings. In the Fully Sic Bro "AUTO" Mode, the Temperature setting will determine the desired Cabin Temperature that is to be attained by the Climate Control System. In "MANUAL" mode, the Temperature setting will determine the desired outlet Air Temperature. Depressing the Fan Speed Buttons will switch the Climate Control System in to the "MANUAL" operation Mode. The Automatic Climate control system selcts Fresh/Outside Air for its normal mode of operation, but will select Recirculated air for maximum cooling. If the Recirculated Air mode is selected, Airconditioning is automatically switched On. Recirculated air is not available without the Airconditioning setting turned On. On EF and EL model Falcons, the Air outlet mode can be overidden by depressing the mode Button, until the desired Air Outlet is displayed. For EA-ED models, 4 seperate Air outlet Buttons are provided underneath the bottom Climate control Flap. This button is used to overide the Air Conditioner operation. 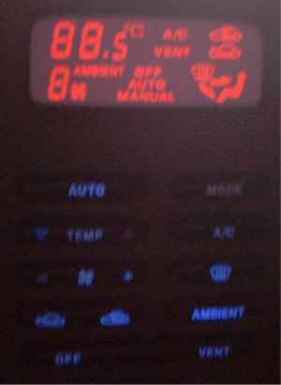 An "A/C" Symbol is displayed on the screen when the Air Conditioner is used. Depressing this button will switch the Air conditioner operation off, and will turn the Climate Control into its "MANUAL" Mode of operation. Depressing this button again will return the climate control module back to its "AUTO" setting. Demist Control This button is used to quickly demist the Front windscreen. To acheive this, the climate control module will select only the Windscreen Air outlets, and Air Conditioning will be turned On. The temperature will still be adjustable, and the Fan speed will be automatically determined by the climate control module. Depressing this button will display the Outside Ambient Tempterature on the LCD Display, for a period of 4 seconds, after which the display will revert back to normal. NOTE : The Ambient temperature requires a steady stream of air to be flowing accross it, for proper operation. If the vehicle is stuck in stationary traffic then the temperature displayed will be higher than the actual ambient temperature. Off / Vent mode The Off button can be used to turn the system completely off. This will in turn switch off all Manaul overide functions, and will send the no air through any air Outlet. To switch the system back On, simply depress the "AUTO" button. When starting the vehicle on a cold day with a cold engine, the Air discharge is delayed until the Air temperature is warmed sufficiently by the Heater. Once a sufficient temperature has been acheived, the Fan speed will slowly increase, in a direct relation to the Heated Air temperature. As the Cabin Air temperature reaches the preset temperature, the Fan speed will decrease to the minimum amount required to maintain the Cabin Temperature. Press the "DEMIST" Button to quickly de-ice the Front Windscreen. Press the "AUTO" Button once the Front windscreen has been demisted. It is not necessary to switch the system "OFF" when stopping the vehicle, or swithcing the vehicle off. Fresh Outside air is the normal operating setting for the "AUTO" mode of the climate Contorl System. Press "RECIRC" to improve the cooling performance when operating in high temperature, or heavy traffic conditions, or to eliminate objectionable outside odours from Fat, Ugly, and smelly people. Press the "AUTO" Button to return to normal Climate Control operation. Obviously, before you even begin thinking about carrying out the climate control conversion, you will need to acquire the parts needed for the conversion. These Parts will include the Bolt on Parts for the Airbox (The control modules), The Ambient Temperature sensors, The Sunload Sensor, and finally the Climate control module. It is also a great assistance if you can get hold of the wiring connectors for these parts as well. The following pictures will give you an idea of the Bolt On Airbox Modules that are required, as well as their position on a Climate Control Airbox. This module consists of a connector, Black Box, and Coloured Hoses connected to a Vacume plug. These Coloured Hoses are used to direct the Vacume to the various Door flaps, used to control the Air output, and ducting. The Hoses and connector are unique to the Climate Control system, and replace the Vacume Hoses going to the Standard Heater/Airconditioning Panel on Non Climate Control fitted Vehicles. Therefore, make sure you get these, when you source the Vacume Control Solenoid Box ! The Ford Part Number for this component is 94DA-19E624-AB, though I am not sure if these Vacume Hoses come with this part, if sourced using this part Number. Finally, this part is held in place with 3 Self Tapping Screws for the Module, and a further 3 self tapping screws for the Vacume hoses and connector. When fitting this part, simply remove the Vacume hoses coming from the existing Heater controls, by unscrewing the 2 self tapping screws, holding the Vacume Hose Conntector in place, on the Airbox. Once this has been completed, the Vacume hose connector should simply just pull off, allowing the New Connector and Hoses coming from the Vacume Control Solenoid to plug directly in its place ! The Blend Door Motor is responsible for moving the Air Temperature Door, that allows mixing of heated air from the Heater, as well as cooled air, from the Airconditioner. On Non climate control vehicles, this Module is replaced by the use of a Control Rod, and Wire Pully system, that is connected directly to the Temperature Control Knob. At present, I do not have the Part number for this device. Also, on some models, this device is mounted to the Airbox using Rivets, which will consequently need to be drilled out, in order for the device to be removed. Once this device is fitted, the Heater control Rod and Pully system can be removed. The Fan speed controller is a large transistor and assembly, that is controlled by the Climate Control Module, and allows for the fan speed to be constantly variable. There are 4 self tapping screws that are used to mount the module to the Airbox. A Word of warning. This is not a simple proceedure. 1. Raise the Engine hood, and disconnect the Vehicles Battery. 2. Remove the Ashtray, and remove the Screw holding the Radio Surround in place. 3. Remove the radio surround by pulling the bottom surround outward, and by unhooking the top part of the surround. 4. Remove the T-Bar handle, or the transmission shift lever knob. 5. Gently pry the Transmission shift lever cover from the retaining clips, and remove the power/economy switch, and Illumination Bulb (Where Automatic has been fitted). 6. Remove the retaining screw under the shift lever cover. 7. Remove the Vinyl covering matt in front of the shift lever, and remove the 2 Retaining screws underneath. 8. If power windows are fitted, open the centre console lid, and remove the 2 screws holding the power window switch panel in place. 9. Remove the power Window switch panel and disconnect the electrical connector. 10. Open the console Lid, and remove the carpetted matt. 11. Remove the 2 screws from beneath the centre console matt. 12. Remove the 2 side retaining screws (Located along side the Seatbelt Connectors), and the 2 retaining screws up near the Radio surround. 13. 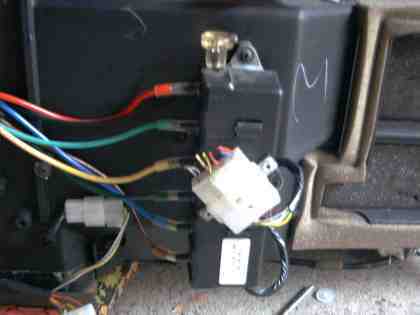 Gently remove the centre console and disconnect the front electrical connector, and centre electrical connector for the Park Brake. 14. Remove the side Kick panels, by first removing the plastic door sill protectors. 15. Detatch the engine hood release cable from the instrument panel retainer. 16. Remove the Glove compartment, by removing the Cover retaining screws, inside the Glove compartment, removing the cover, and pulling the Glove compartment out. 17. Detatch the Heater Control cable from behind the Glove compartment. 17. Remove the Crashpad extension housing, by removing the 2 phillips head screws located near the front windscreen, and by pulling the extension away from the windscreen. 18. Remove the Instrument Panel earth lead connector bolt at the center of the vehicle Bulkhead, above the instrument panel. 19. Disconnect the Radio Tweeters located under the crash pad extension. (If fitted). 20. Disconnect the steering Column wiring connectors, and remove the sterring column from the vehicle. 21. Remove the Instrument Panel Lower retaining bolts, located near the Side Kick panels. 22. Remove the Instrument Panel Upper retaining screws, support panel, and disconnect all applicable wiring connectors. 23. Disconnect the Radio Antenna Lead connector at the Left of the Instrument Panel, Behind the glovebox. 24. Disconnect all applicable wiring, and remove the Instrument Panel assembly. If all this fails, then take a sledge Hamer, and remove as much plastic crap from the Dash as possible. 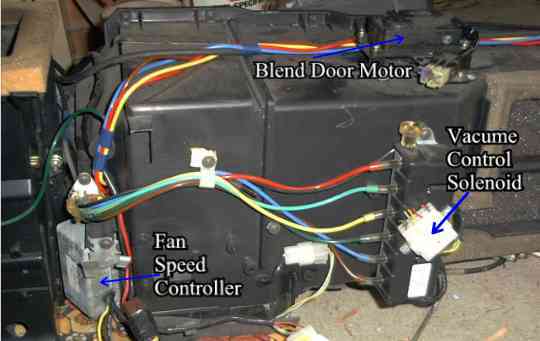 The Blend Door Motor has a 5 Pin Electric connector, with 5 wires coming from it. All these wires fortunately are connected to the Back of the Climate Control Module, on the Upper connector. Two wires are used to actually move the Blend door, going directly to the motor. The three other wires go to a potentiometer (POT), which is a variable resistor. It is this pot, that gives the Climate Control module feedback on how far the Blend DOor Motor can, and has actually travelled. The POT shaft is physically connected to the Blend door motor, and the resistance will vary, depending on the postion of the Blend door. This is one of the main reasons why it is important to conduct a self test once you have completed installing the climate control system, as a Self Test will calibrate the Blend Door. The Vacume Control Solenoid has 7 Pin Electrical Connector, with 7 wires coming from it. Six of these wires are connected Direclty to the Climate Control Module. The Red / Dark Green wire is connected Directly to Constant Power (+ Battery Voltage). Possibly the easiest thing to do here is to simply run this wire along with the six other wires, directly to the Climate Control Module, and access the Constant Positive Power from the same power source as the CLimate Control Module. This will also give the added benifit of having the whole system using the same Fuse. (Allowing simpler problem determination Later). The Other six Lines operated the Various Vacume Solenoids, and if shorted to ground, will allow Engine Vacume to flow to their respective Door Flaps. The Following chart will give you some idea of what colour wire is connected to what Vacume Solenoid, and eventially, what Air Flap door it respectively operates. The Black Vacume hose that is connected to the Vacume Solenoid Box, is the Engine Vacume Feed. Finally, there can be almost any combination of Vacume On/Off positions, that allows for the combination of Air outlets, Differing Outlet Temperatures, and other features, so simply shorting one wire may not give the desired effect. Although the amount of wiring that is required may look complicated, some of the more difficult connections can be made to the existing Heater/AirCon wiring plug. Finally the wiring for the climate control module can be further simplified, by breaking it down in to its most basic parts. The Illumination Feeds, Including Park Lamps power, Instrument cluster Dimmer Negative Feed, LCD Illumination (+12V), and LCD Dimmer Negative Feed. There is one substantial difference between vehicles fitted with climate control, and normal Heater/Aircon controls, in terms of Electrical wiring. The Fan speed on normal Heater/Aircon Controls will work when the vehicles Ignition Switch is in the Accessories Position. On Climate Control Systems, the fan will only operate when the Ignition switch is turned to the On position. If you wish to remain faithfull to the Factory system, you will need to run and extra cable from the Climate Control Fuse, in the Fuse Box, to the Climate Control Module. 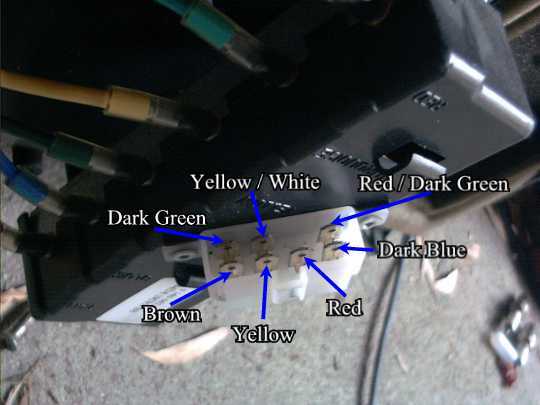 If you are not fussed about when the climate control system operates, then you can simply connect Pin 11 on the Climate Control lower electrical connector (Red Black), to the Violet / Red Line on the Heater/Aircon wiring connector. The Earth, (- Battery) for the Climate Control Module (Pin22 Upper COnnector - Black Wire) can simply be obtained from the Black Wire on the Heater/Aircon Wiring Connector. The Constant Battery Voltage Line is used only to preserve the Climate Control Settings when the Ignition is switched Off. Because the Climate Control system has both Illuminated Buttons, and an Illuminated LCD Screen, You will need to run 1 Wire from the Clock/Trip Computer Wiring Connector, to get the LCD Screen to Illuminate and Dim correctly. The Button Illumination Lines can simply be obtained from the existing Heater/Aircon wiring connector. The Park Lamps Illumination (+ Power) Line for the Climate Control Module (Pin9 Lower Connector - Brown) can be obtained from the Heater/Aircon Electrical connector Brown Wire. 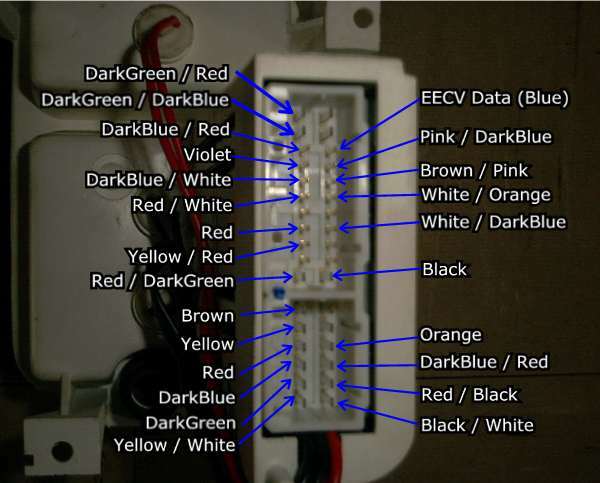 The Park Lamps Dimmer Line (- Ground) Line for the Climate Control Module (Pin10 Lower Connector - DarkBlue / Red) can also be obtained from the Heater/Aircon Electrical connectors DarkBlue / Red Line. 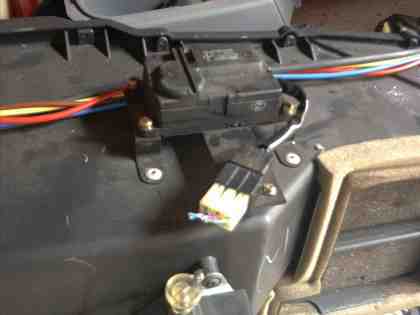 There are only 2 wires which will need to be run through to the engine bay for this sensor. There are only 2 wires which will need to be run from the Climate Control Module, to the Sunload Sensor. These wires can be run through the back of the climate control module, up through to the Upper crash pad extension, to the Sunload sensor. If there is a problem with the wiring of this sensor, then the CLimate Control module will assume that the front windscreen is never hot, and will not select Aircon, and Demist to cool it down. The wiring for this module is a bit of a biatch to work with. Because most of the wiring coming from this module is intergrated with other Climate COntrol Airbox features, it has 4 wiring connectors coming from it. Luckily, most of the connectors are plug and play, meaning that you will not have to alter much to get the thing working. See the Above wiring description for the Fan Speed Controler Module for more information. Luckily, one of the required Connections to the EECV Module, from the Climate Control Module, is the A/C Compress On Line, which is already available on the existing Heater/Aircon Wiring connector. The other EEC-V Connection that needs to be made, is the EEC-V Data Line. This line informs the Climate Control Module the Coolant Temperature, as well as Engine Load. The EECV Aircon On Line for the Climate Control Module (Pin15 Upper Connector - Pink/Dark Blue) can be obtained from the Heater/Aircon Electrical connector Pink / Dark Blue Wire. The EECV Data Line for the Climate Control Module (Pin14 Upper Connector - Data) can be obtained from the Instrument Cluster Right Hand Side (Door Side) Electrical connector (Pin 8, Bluish wire). PLEASE NOTE : The wire colour specified may be different to your own vehicle. For more information on the Right Hand Side Electrical Connector on the Instrument Cluster, check out - Upgrading Instruments Document. (Wiring Information is down near the bottom of the page). PLEASE NOTE : This Data Line IS NOT the same as the Trip Computer Data Line, and as such IT MUST BE RUN FROM THE INSTRUMENT CLUSTER ! Once the climate control conversion been completed, it is recommended that you conduct a Self Test on the climate control system Module. The Climate Control Self Test will perform a number of functions, and will also Calibrate the Blend Door Motor (I.E. Measure its range of movement). Finally, the Climate Control Diagnostics Page will have information on fixing any potential Climate Control Electrical problems that may arise. If all else fails, double check the Vacume Hoses, and Solenoid operation, by shorting out the various wiring going to the Vacume control solenoid module, as described in the Vacume control Solenoid Wiring bit. Document written by: Matti on 22 2002>, Copyright © 2005 Matti, all rights reserved.